← Dec. 8, 1907: Jewish Refugees, Fleeing Russian Persecution, Come to L.A.
What has become of the Rose Queens of yesteryear? What has happened to the girls who in the past have ruled over the glamour, excitement and pageantry of the Pasadena Tournament of Roses? Did that cherished title start them on the road to fame and fortune or did it leave them just happy memories, a scrapbook and a pressed red rose? In 1979, The Times surveyed former Rose Queens, finding that many of them lived in Orange County. 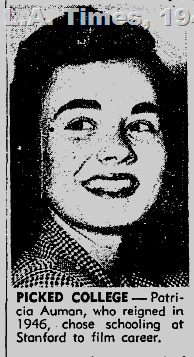 One of the women interviewed by Lael Morgan was Patricia Auman, the Rose Queen for 1946, who selected an education at Stanford over pursuing a film career. “While the tournament has always stressed it wasn’t a beauty contest I don’t like the emphasis on looks. I wish they would do away with it entirely or combine it with achievement; what a person is, now how they look,” she said. This entry was posted in 1947, Film, Hollywood, Sports and tagged #Rose Parade, 1947, Patricia Auman, Rose Queens, Tournament of Roses. Bookmark the permalink.